This tutorial will explain how to make a tavern where you can purchase your starting heroes. These taverns are common on the newer DOTA maps and some of the hero siege maps. When you have a lot of heroes, a tavern is nice because it takes much less room on your map than a hero arena does. We will cover creating the tavern, the heroes, and the triggers to make it all come together. Were going to use the techtree and custom gameplay constants to restrict heroes to 1. This way, you don't have to use food, gold or lumber anymore! This allows you to use resources for other things, making a better map. A hero tavern uses icons to sell heroes. The first step is prepare you heroes for the tavern. We also need to change the costs, techtree requirements, and button position of each hero for the tavern icon. The tavern will sort the heroes automatically, but when a hero is sold they will all shift to a new location. That's quite annoying, and we can prevent that by setting the units icon position. Taverns can hold up to twelve heros. Button positions determine the icon locations of a hero. Now you need to change your heroes to be compatable at the tavern. Remember that players start with zero resources, so unless your giving the players resources, the hero should cost nothing. To prevent players from owning more than one hero, we will modify the techtree requirements. Below is a list of fields you need to change, and a brief explenation of each. * You'll notice some of these are default settings. But that is not true on all hero units. Art - Button Position (X) X position of the hero icon. Art - Button Position (Y) Y position of the hero icon. Stats - Gold Cost How much gold your hero will cost. Stats - Lumber Cost How much lumber your hero will cost. Stats - Food Cost Hero food cost. Probobly 0 for your map. Stats - Stock Maximum Change to 1. Stats - Stock Start Delay Were going to use 15 seconds. Techtree - Requirements Any Alter. Techtree - Requirements - Tier 2 Any Tier 2 hall, Any Alter. Techtree - Requirements - Tier 3 Any Tier 3 hall, Any Alter. Now we'll need a tavern to sell our heroes. I am going to start with the Tavern unit, which already sells heroes and it's a good template. The tavern is found in the object editor, under neutral passive buildings. Right click it and create a new custom unit. Next we add all of the heroes we want the tavern to sell. The field inside the tavern we want to change is Techtree - Units Sold. Double click it to change it, and add in all of your heroes. Again, the tavern can sell a maximum of twelve heroes. Your tavern is ready, so now we can place it on the map. The tavern should be in a remote area, farther away from gameplay than your other units. You will also need a region to place the heroes inside when a player picks them. You will need a player unit somewhere near the tavern, so that a player can purchase units from it. Most commonly used unit is the circle of power. 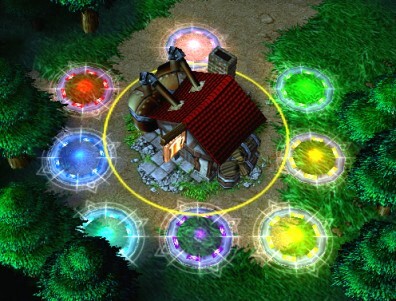 Place a custom circle of power for each player that can buy heroes from the tavern. I like to make my circles of power very small, so they are not obviously seen. You can change the Art - Scaling Value to .10 and hide them behind the back of the building. Place the player units near the tavern. I prefere to hide mine. Next we need to alter the gameplay constants to restrict heroes to 1 per player. Check the box at the top that says 'Use Custom Gameplay Constants'. Find 'Techtree - Dependancy Equivalents - Alter'. Here, add your custom circle of power we are using next to the taverns. You now have a legitamate alter on the map, using the circle of power. This will allow you to purchase a hero. Find 'Techtree - Dependancy Equivalents - Hero'. This controls which units count when restricting heroes. Clear all heroes already on the list. Now one by one, add your custom heroes here. This prevents your players from purchasing more than one hero! The first trigger you will need is a trigger to give every player some starting resources. Most importantly, this trigger ADDS ALL HEROES to an array variable. This is used to generate random hero picks. Our trigger will run when the map starts. Total_Heroes is how many heroes you have. 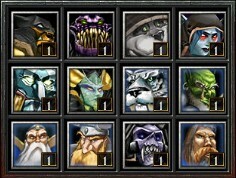 I have 8 heroes. Random_Count is how many randoms are left. Should be EQUAL to your Total_Heroes. Hero_Array contains ALL your custom heroes. Random_Data is used for choosing a random, uniqe hero. This should ALSO be equal to your number of heroes. Now we'll need a series of triggers. My demo map is more advanced, so I'll list which triggers I needed. You do not have to have all these features in your map, but it is popular now a days to have a random command and repick command. The times and methods I used are preferences based on popular maps. You can change the times and how things work to your liking. But for this demo, we are going to use these triggers. A trigger for when a unit is manually purchased from the tavern. A trigger for the -random command. A trigger for the -repick command. A trigger to do 'all random'. A trigger that turns on repick and random after 15 seconds, and turns off all random. A trigger that turns off repick and random after 45 seconds. When a hero is chosen in any way, it is taken out of the array using a mathematical sequence. Therefore, we never need to worry about whether or not a unique hero was chosen, because it no longer exists in the array!